It’s the Grand National and it’s one of the most famous horse races of the year it’s the race that everybody has a bet on, but very few will win. My first suggestion for you is to pick a horse at random from the ground national, after all, that’s what everybody else does. If you do this you won’t feel like you’re missing out! Obviously, that’s the least effective way of doing it and if you pick a horse at random because you like its name or its colors or perhaps somebody ran a news story in it you do basically handing your money over to a bookmaker because the Grand National is one of the most profitable days of the year for the bookmaking industry as people don’t have a clue who’s going win the race and a lot of pundits have no clue either, so everybody throws a bit of money into the Hat and lo and behold most people lose and it’s only the bookmakers that win. So my first real tip for you is to not use a bookmaker but to place a bet on a betting exchange. With a betting exchange if you do happen to win, then you’ll win a lot more money. It’s worth it just for that alone. If you want to put a little bit more science into it and you’re prepared to dig around in the form lines, there are some things that have generally worked pretty well at the Grand National. Favourites don’t tend to win at the Grand National. The price gets shortened up by the bookies because everybody has a punt on the favourite and there will be more money bet on the favourite than any other runner. However, that’s generally not reflective of its true chance, so favourites have a terrible record at the Grand National in terms of getting a payoff. It’s a good idea to have a horse that has been out and jumping and racing regularly. Yes, you can prepare a horse to get fit for the Grand National, but there’s no replacement for experience so try and choose a horse that has been running fairly recently and preferably one over a reasonable distance preferably over three miles. It’s rare for a winner at the Grand National to have not done that and had a little bit of experience and not run fairly recently. All bar one of the last 27 national winners have raced eight weeks or less prior to winning the Grand National and only two of the last 21 winners had fallen or unseated their rider more than twice prior to winning the Grand National. Younger horses have a poor track record and the older horses tend to have a poor record as well, so try and look for horses that are aged under 9 to 10 or around that level. Basically, the more extreme you go out the less likely you are to find a winner within that particular range. Horses that are handicapped 135 or higher have a good record. Lower than that and they don’t tend to present many opportunities, but also not being top weighted will probably allow you to find a better selection. Top weights tend not to win. Using the above tips will help you narrow the field and place a bet on a horse that is more likely to win, but of course, there are 40 runners! Backing more than one selection using advanced strategies such as dutching. I’ve gone back over 20 years worth of Grand National results and had a look at which parts of the fields tend to be more or less profitable. What I found was that runners one to four tends to be overbet and don’t tend to produce a good result when dutching. Likewise, at the back of the field, you’ve got a range of horses that it probably has no chance whatsoever so it’s better to exclude those so bring your focus to the middle of the field and you’re quite likely to be able to pick up a runner that’s going to win the race. If you dutch runners five to twenty that has consistently produced a result over many years. That doesn’t mean that it’s going do it this year, but if that pattern holds it’s quite likely that you will profit. Check to see f there any horses in the race that have trouble starting the race or often refused to jump. A few years back there was a horse called ‘Bettle group’ I saw on my notes that this horse had refused to race several times in a row before the Grand National. I was surprised to find it running. I can’t imagine how much money was going down on this horse and in sweepstakes and various other methods of finding a winner that was going to be completely wasted. So after I finished trading, I laid him. It was a very very simple strategy, but one that people very often overlook. 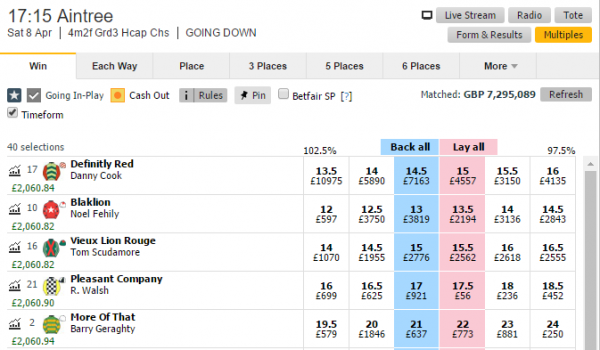 Rather than have a bet trading is a great way of profiting from horse-racing. The best thing about it is you can profit regardless of who goes on to win the Grand National and even before the it has started, sounds crazy but it’s completely true, I have produced videos on the trading process and an interview with the BBC where I talk about trading so if you want to know specifically what earth is going on there and how I can produce results like the one you see in this blog then watch some of those videos. You should also visit the Bet Angel blog and read some of the stuff there or better visit the betangelacademy.com where you can do a trading crash course to get you up to speed on pretty quickly. You may not be able to get it sussed by this year’s Grand National, but the experience you gain will hopefully bring you in a much better position to win from racing in general or maybe and next year’s Grand National? The top tip has to be, learn to trade. Good luck whatever you choose to do!